Trails to ride from Mt. Crested Butte or Crested Butte if you flew in and didn’t get a rental car. We often tell people that if you fly here to Crested Butte in the winter, you definitely don’t need to rent a car, but if you fly in in the summer, you probably do. In the winter months, most of the roads out of town and trailheads are blocked by snow and most of the action is at Crested Butte Mountain Resort or accessible via an easy bus ride. In the summer, especially for mountain bikers, the amount of ground you want to cover is large enough that most people would want to rent a car. Luckily, a good chunk of our best trails are accessible right outside of downtown Crested Butte or Mt. Crested Butte. Plenty of locals spend an entire summer riding around here without ever putting their bike on a rack. If you’re staying in Mt. CB or Crested Butte and don’t have a rental car, here is what we recommend you hit. Note that these are not ALL of the trails within close proximity to town. They’re just the ones we think are the most Crested Butte-ish of the trails close to town. In our minds that means: fairly hard climbs, fun, ripping descents, and gorgeous views and flowers. Note that these rides are also a great way to go if you’re not sure what the weather will do. You’re never too far away from shelter so it’s pretty easy to get back to one of the towns if a thunderstorm starts to build. Get the free CBGTrails map app for a map of all of these trails and 145+ others! This trail combination offers some of the best wildflowers and views in the Valley. The 403 and 401 probably just barely edge out Snodgrass and Lupine for the best flowers and views, but riding the full 804 (what locals call 403+401) from town is a burly proposition. Snodgrass-Lupine offers a great ride-from-town option. How Should You Ride Snodgrass-Lupine? We did a ride report last summer with a bunch of the different ways you can go out and ride Lupine. One of the ways that didn’t make it is to ride Snodgrass first and then connect to Lupine. This is one of the more popular ways to ride it. Start by heading up to the Snodgrass Trailhead past Mt. Crested Butte where Gothic Road turns to dirt. Head up the Snodgrass Trail (the CBGTrails trail map app can tell you where you’re going). Follow the trail, being cognizant that part of the trail goes through private property that is shared by local ranching families. 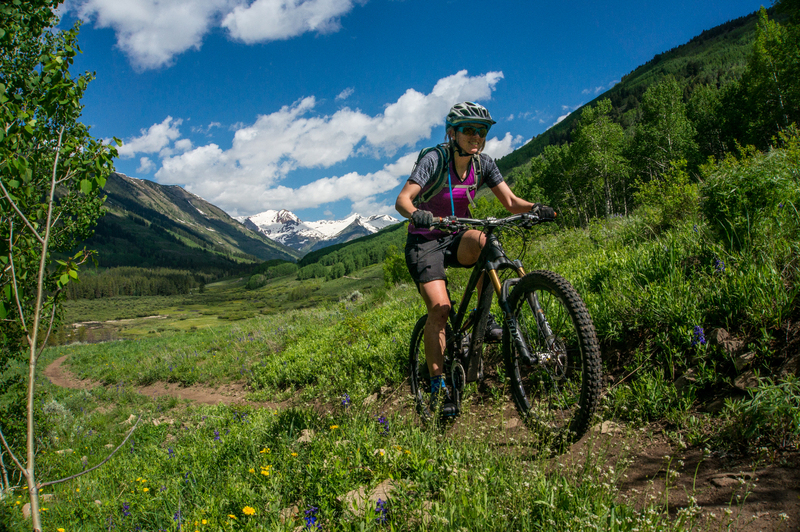 Snodgrass offers some of the most beautiful views of Crested Butte Mountain and the surrounding meadows of wildflowers that you’ll find anywhere in the Valley. Snodgrass is old-school CB trail, so it’s narrow in spots. There’s a good chance that at least once on the ride, you’ll either hit your bars on an aspen, or be 100% convinced you’re going to! The last little section down to Washington Gulch is a great stretch of track. It’s fast and flowy and fun. Then head back toward the mountain and Gothic Road to ride the couple of road miles down to the Saddle Ridge entrance. Make a right and climb to the top to access Lupine 1. and follow that up, across, and down to the bottom where you’ll hit an old road climb. Climb this overgrown dirt road at least until Lupine 2 (fun, bermy, fast flow) or keep going all the way to Gunsight Connector to get to Doug Bradbury’s masterpiece of making the most of a small parcel. It’s swoopy and fun and more of a cross-country trail than either of the other Lupines. Note that both Snodgrass and Lupine Trails cross privately owned cattle-ranching country. Due to their status as mixed-use and privately owned, they both experience intermittent closures at various points in the summer. Follow us for updates and obey all posted signs. Green Lake Trail , literally right outside of town, embodies the brutal challenge of riding in the Gunnison Valley. A steep, punchy climb followed by the sweet reward of dropping what you just suffered through. 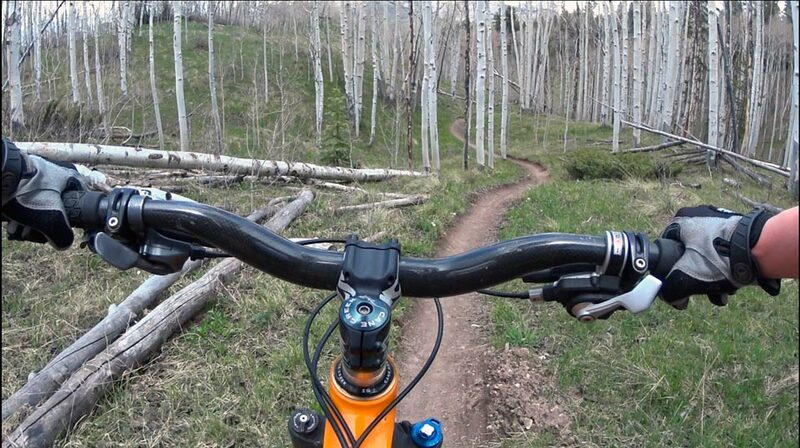 Much like our skiing, our mountain biking leaves us thinking steep thoughts. How Should You Ride the Green Lake Trail? Green Lake is accessed from the Bench above the Crested Butte Nordic Center. Access is granted by a private homeowners group so, much like Snodgrass and Lupine, reading and obeying all signage is key. After going through the subdivision, you’ll start climbing singletrack through the woods. There are some tight, steep switchbacks in the dark timber and some roots. The dirt is also really loamy, which is pretty atypical for this Valley. After the dark timber singletrack, you’ll pop onto an old mining road and keep going up. The hardest part about this section is that it is 100% rideable. Get in your granny gear and crank, crank, crank until you’re through it. Then you’ll pop out into the upper part of the subdivision before you end up on more singletrack which eventually leads you to Green Lake. At this point, you’re up really high and the trail gets a little more technical so it’s HARD. Just remember, the climb is worth it because after you reach the top, you get to fly back down what you just climbed. At the top, hike out to the lake and enjoy a break and a snack before you turn around. Sometimes locals will pack in a beer or go for a swim at the top. Then it’s time to pin it to the bottom. Keep in mind that this is a fairly popular hiking and trail running trail so don’t go so fast you can’t stop. These trails offer a nice little mix of technical sections through the aspens combined with some really nice flow. They’re also right on the side of Crested Butte Mountain, which is pretty cool! Happy Hour was a joint project between CBMBA and the Evolution Bike Park built over the course of a few summers to connect the trails at the Bike Park all the way to downtown Crested Butte on singletrack. If you’re here in September or October when the leaves are at peak, this is one of our favorite trails to ride through the aspens. How Should You Ride Happy Hour and the Upper Loop? 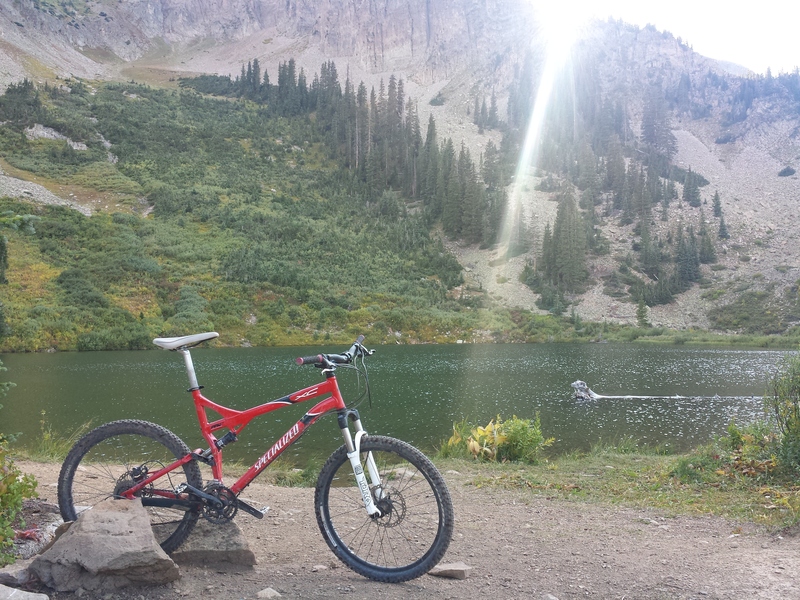 From the town of Crested Butte, head out to Tony’s Trail at the East end of Elk Avenue (past 9th St.). Climb Tony’s until you hit the boulders and make a left to climb onto the Upper Loop. There are some technical sections that are very hard to clean. Don’t get discouraged. Climb all the way up the Upper Loop until you hit Hunter Hill Road, and then ride out to the base area. From there, you can jump on the Red Lady Lift if you have a lift ticket, or just climb the front side of the mountain to pick up the West Side Trail at the top of the lift. Then Cruise down West Side and pick up the Happy Hour Trail when it forks off to the left. After riding the fresh trail through the Aspens, you’ll get back to Upper Loop and be able to head down that to town via Tony’s. Strand, like Snodgrass, is an absolute classic in Crested Butte. The flowers are great, the climb is punishing, the descent is fast, flowy, and a little loose in places. You’ll find spots of tech among a mostly smooth ride. How Should You Ride Strand? There are two ways to get to Strand from town. Ride the highway to Brush Creek Road is number one, then ride that out to Strand Hill Road and climb. The other is to Ride Tony’s to the Upper Loop, to Bridges and the Upper Upper, and then out to Brush Creek Road and to the bottom of Strand. It’s all about how much gas you have in your tank and how much time in your day. Then, when you get out there you can choose to climb the Canal Trail to the Strand Bonus OR just climb up Strand Hill Road. The first option is less direct and not as steep while also being on singletrack. The second option keeps you out of the way of downhill riders and gets you up to the downhill quicker. Almost all of the Strand Downhill is smooth and fast. There are a few really steep loose sections. There are also a couple of pretty challenging rock gardens. Following this itinerary is much easier if you get the free CBGTrails Trail Map app, the only complete trail map app for the Gunnison Valley. It will also give you the option to branch out and explore some of the other trails on your own.